Scrape along the mussel shells and check the cleanliness - if necessary remove limestone parasites. Wash mussels by brushing vigorously in cold water. Repeat several times. Chop the oregano, garlic, parsley and add 4 tablespoons of olive oil. 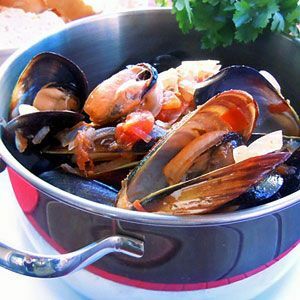 In a casserole dish, heat the mussels in olive oil. Add 100ml of water, cover and cook 5 minutes. Add the white wine and cook until mussels open. Remove the mussels and cook the pan juices. When boiling, add the chopped tomatoes and the chopped mixture content. Pour the hot sauce over the mussels just before serving.